So how many toys does a kid need anyways? I drive up almost every afternoon while Lee is working. Today’s project for me was taking out some limbs, blackberry bushes, cleaning up trash, sorting through toys, and making a walkway around the barn. We can’t insure the barn until it is painted and has tree limbs cut back. 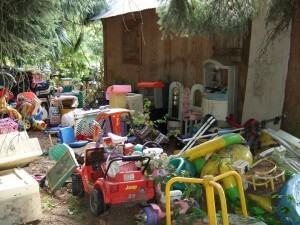 I’ve never seen so many toys before as what was left on the property. I think I would have been in heaven as a kid and my parents had bought this place. I foresee a yard sale in our future to try and get rid of this stuff. This entry was posted in Cleanup. Bookmark the permalink. One Response to So how many toys does a kid need anyways?